Tzu Chi University has been devoted to research in Biomedical Science and Biotechnology. 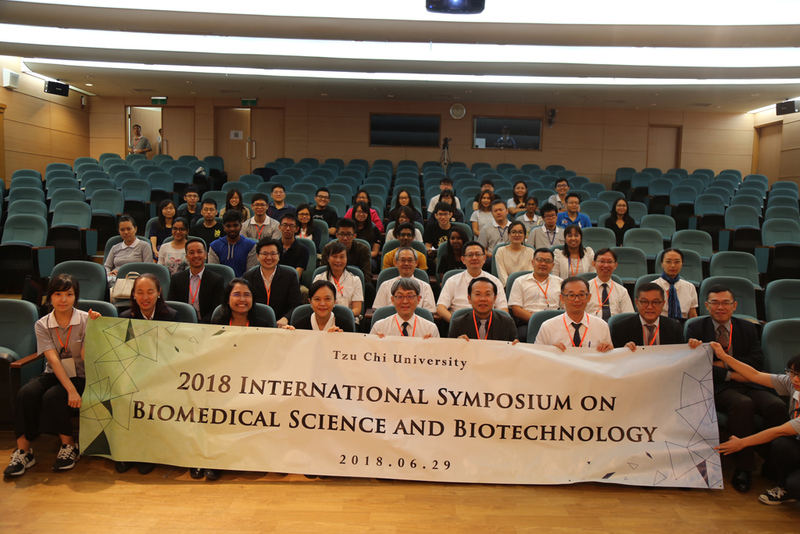 On June 29, 2018, the Department of Molecular Biology and Human Genetics, and the International College Provisional Office sponsored an international symposium. TCU invited the professors of Naresuan University, Thailand, University of Science, Malaysia, and Ateneo de Manila University, the Philippines, to attend. A total of over ten professors led academic exchanges and shared their research experiences, while over 100 participants, including TCU’s faculty members and students, attended this conference. TCU’s Vice President Ingrid Liu thanked the professors, who are associated with three of TCU’s sister universities, for coming all the way from their countries to participate in this conference. These professors, together with TCU’s faculty members, a total of ten, led discussions about the future development of Biomedical Science and how they are going to face coming challenges. TCU is expected to enhance collaboration with other overseas universities on research and a dual degree program. Dr. Sutisa Nudmamud-Thanoi, the Director of Centre of Excellence in Medical Biotechnology, Naresuan University, was impressed with TCU’s learning environment, which enables students to gain knowledge and skills peacefully and methodically. She anticipated working closely with TCU in academic research and student exchanges. TCU’s Professor Chih-Wen Peng delivered a speech, on the topic of “Epstein-Barr Virus”. The “Epstein–Barr Virus” (EBV), also called human herpes virus 4 (HHV-4), is one of eight known virus types in the herpes family, and is one of the most common viruses among humans. EBV related studies have been of huge importance to our understanding of how viruses can cause cancer. TCU’s Professor Shun-Ping Huang presented her study on, providing related pathogenic factors and molecular mechanisms for development of a therapeutic strategy for clinical NAION patients. This is a major cause for sudden vision loss among the elderly, and Professor Huang wished to use this research finding for treating stroke patients. Naresuan University’s Sutisa Nudmamud-Thanoi shared that methyl amphetamine, which is a drug stimulant reagent of the central nervous system, can change hormonal receptors in spermatogenic cells and consequently lead to lower sperm quality. Her team discovered that Thailand’s germinated brown rice contains GABA. Thus, eating germinated brown rice helps reduce the impact of methyl amphetamine, and improves sperm quality. Ateneo de Manila University’s Dr. Crisanto Maglaque Lopez gave a talk entitled “Fungi: the good, the bad and the ugly.” In his speech, he shared how fungi can be utilized to produce many useful things, but nevertheless can cause many diseases. Dr. Crisanto Maglaque Lopez paid tribute to knowledge of the latest cellular and molecular biology techniques for his study findings. TCU’s Associate Professor Hao-Jen Hsu talked about the treatment status of sepsis. Septicemia mainly occurs during hospitalization. Although progress has been made in drug treatment and intensive care, it is still a treatment problem. Previous studies have demonstrated that high concentrations of proinflammatory cytokines cause direct or indirect damage to the host, so characteristics between proinflammatory cytokines and their cognate receptors have been analyzed to design the complex peptide KCF18, to simultaneously neutralize cytokines and reduce the concentration of inflammatory mediators in the bloodstreams of patients with sepsis. Simulations showed that KCF18 can bind to cytokines at the same time and electrostatic interactions dominate. This study suggests that the bracteolar structural-functional peptide design can be used to develop potential anti-septic drugs. 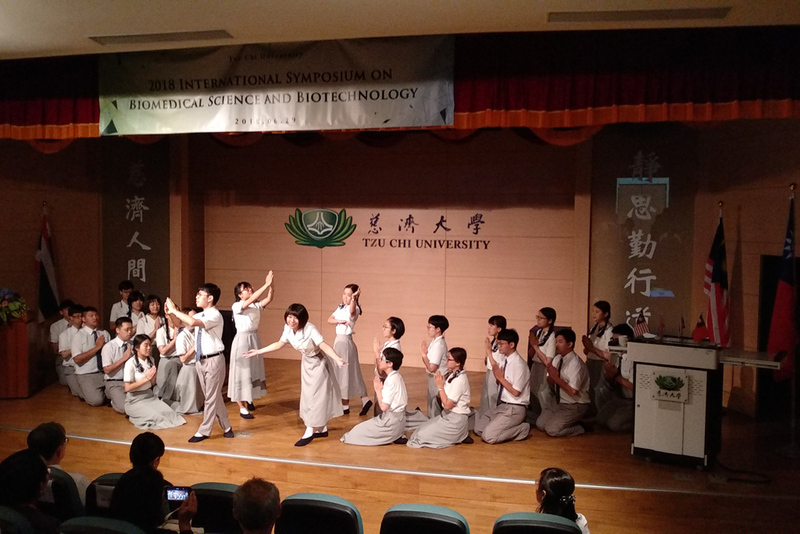 Tzu Chi University Vice President Ingrid Liu presided over the closing ceremony. This was the first time for TCU to sponsor an international symposium on Biomedical Science and Biotechnology. She expressed belief that everyone gained a lot from participating in this conference. She wished that the four universities will work with each other on more research endeavors, and collaborate on projects to come. Thus, all of us can enhance our research capabilities and nurture more scientists, in order to improve the health and wellbeing of humanity.